Since the term “artist” encompasses a wide array of disciplines, trying to decide who’s “best” feels futile and unfair (like comparing a glassblower to a performance artist). 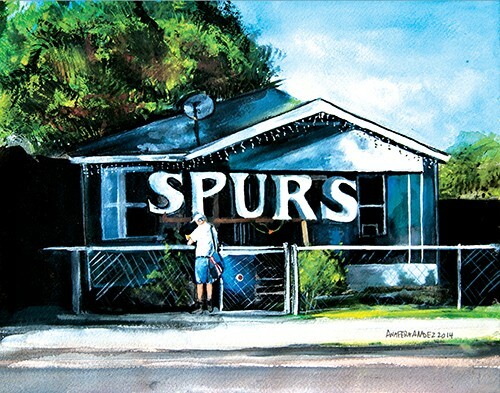 But what about who creates art that best captures San Antonio? A solid answer to that question is Ana Fernandez — a Corpus Christi native who moved here during high school, earned degrees from the School of the Art Institute of Chicago and the University of California at Los Angeles, and officially adopted San Antonio as her hometown in 2009. A local favorite and double threat, Fernandez has won over diehard fans with both the creatively concocted raspas she sells out of her Chamoy City Limits food truck and her moody, slightly mysterious paintings depicting old-school San Antonio homes, storefronts, street scenes and parking lots. With a sold-out 2016 exhibition and a CAMMIE Award already under her belt, Fernandez wowed us (and others) with her recent Contemporary Art Month exhibition “Magic Time Machine” and has plenty more on the horizon, including a September exhibition at the Guadalupe Cultural Arts Center.